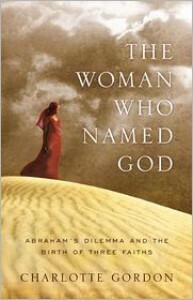 In the page before the Table of Contents, Charlotte Gordon quotes the affirmations of God’s uniqueness found in all three Abrahamic faiths (Deuteronomy 6:4, the Apostles’ Creed and Koran 2:255). Gordon’s book is a perfect example of Robert Wright’s argument in The Evolution of God by Robert Wright] that every generation reinterprets its scriptures in light of social, economic and political contexts. In this instance, Gordon offers a rereading of the Abrahamic origin myth that stresses the similarities between Judaism, Christianity and Islam, and the irrationality of disputes among these faiths. (In the light of recent history, it should be obvious why some would see the need for this type of reinterpretation.) She also reads the story of Abraham, Sarah and Hagar, and their descendants+ as a story reflecting a dysfunctional human family learning to cope and to accept each other. Unfortunately, I am not the audience for this book. As a nonbeliever, I have no need to reinterpret the Abrahamic myth nor am I convinced by Gordon’s explication of Abraham’s clan as an archetypal human family. I give it two stars not for any serious lack of writing ability or interpretative skill but because it didn’t address personal interests or offer any radical new insights. This did not, however, make it an uninteresting or useless read. I think the value in a book like this, particularly to believers, is in its reinterpretive value. Recently, I reviewed Dan Diner’s [b:Lost in the Sacred Why the Muslim World Stood Still. There the author advised Muslims to become more secular, creating distinct lay and religious spheres in life as has developed in Western culture. Leaving aside the problems that’s caused for the West, I argued that it was silly and counter-productive to counsel such a course of action, and that a better strategy would be to read scripture in a way that accommodated modernity, stressed cooperation and retained the “sacred” in mundane life. Which is precisely what Gordon is attempting to do here. I am unqualified to judge how successful she is in the light of other readings but this shouldn’t be dismissed in the effort to reconcile so far intractable disputes. •	God’s command to Abraham “to go forth” reflects the emergence of the self (cf., Jaynes’ [b:The Origin of Consciousness in the Breakdown of the Bicameral Mind|22478|The Origin of Consciousness in the Breakdown of the Bicameral Mind|Julian Jaynes|http://ecx.images-amazon.com/images/I/41FlFSjt2OL._SL75_.jpg|1311139]). •	God’s relationship with Abraham’s family, particularly Hagar, is the first time he establishes a personal relationship with worshippers. •	When Hagar names God as “El-roi” (Genesis 16:13), Gordon interprets it as “the one who sees me.” The traditional interpretation is “the god seen in a vision.” If Gordon’s interpretation is the more correct one, she can argue that it’s the first instance of a deity taking notice of one of his worshippers. •	Number one is that Gordon assumes that the God of Abraham is the modern concept of God. For some believers this may be perfectly acceptable but the historical evidence is pretty clear that there were no monotheists in 1700 BC (at least none whose stories have survived). Assuming an individual named Abraham actually existed, he was at best a monolatrist. •	Which brings me to my second objection: Gordon ignores the manifest evidence that the Abraham story is a synthesis of now forgotten myths edited by post-Exile Jewish priests. •	She emphasizes Abraham’s “wildness” despite the fact that he and Sarah both came from some of the oldest cities in Mesopotamia, and has a very simplistic vision of the relationship between ancient urban centers and the hinterlands. •	She also makes odd interpretations in other matters. For example, referring to Paul’s “Letter to the Romans” as an attempt to convert Romans to Christianity when he was writing to an established congregation of Roman Christians – they were already believers. In Genesis 18, she argues that God is a fourth presence and not one of the three men who approach him at Mamre. Both my reading and others I’ve seen, include God among the trio. While it’s possible to interpret the words that way, it’s decidedly not the usual one and needs more justification (is the ancient Hebrew clearer?). •	Gordon strays into heresy on page 190 when she suggests God is not all-knowing. This isn’t a bad thing in my view but if Gordon is trying to convince believers, she loses them here. •	Related to my first point above, Gordon accepts the historicity not just of Abraham et al. but also the events of the story (i.e., Sarah’s seriously post-menopausal pregnancy). •	Lastly, Gordon indulges in a lot of speculation about the principals’ motives and thinking that’s ill supported. + For simplicity’s sake, I’m going to use Abraham and Sarah throughout rather than Abram and Sarai for the pre-Covenant period. You’ll notice that Shem, a survivor of the Flood, was still alive when Abraham came screaming into the world. Even more remarkable – Noah was still kicking around. In fact, he would hang on until the 450th year after the Flood. The most remarkable “fact” that emerges is that Eber, Shem’s great-grandson and Abraham’s great-great-great-great-grandfather survived Abraham by 30 years. Does this mean anything? Probably nothing more than a caution against blindly asserting the inerrancy of the Bible. After all, what need would God have had to reassert his power when survivors of the worldwide – WORLDWIDE – Flood were still breathing in Abraham’s day?